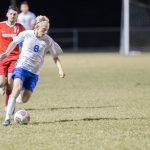 Wednesday, January 4, 2017 8:00 PM Mulberry High School AWAY 3 Bartow High School HOME 2 Game Recap The boys soccer team dispatched on the rival Bartow Yellow Jackets 3-2 last night in Bartow. The team will look to complete an undefeated week tonight as they host Tenoroc in an important district match. Thursday, December 1, 2016 8:00 PM McKeel Academy AWAY 1 Mulberry High School HOME 1 Game Recap . Wednesday, November 30, 2016 8:00 PM Mulberry High School AWAY 0 Lake Gibson High School HOME 3 Game Recap The boys soccer team fell to Lake Gibson 3-0 last night. Tuesday, November 29, 2016 7:00 PM Mulberry High School AWAY 3 Tenoroc High School HOME 0 Game Recap The boys soccer team won a pivotal road district match at Tenoroc by a score of 3-0. The win improves the Panthers record to 4-1-1 on the season. 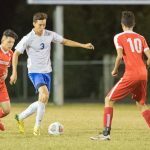 Monday, November 14, 2016 8:00 PM Hardee AWAY 0 Mulberry High School HOME 0 Game Recap They boys soccer team played to a scoreless draw last night vs. Hardee. Their record now stands at 2-0-1. Wednesday, November 9, 2016 8:00 PM Lake Region AWAY 0 Mulberry High School HOME 2 Game Recap The boys soccer team defeated Lake Region 2-0 to keep their undefeated season alive.